It is difficult to believe that in a time before it was possible to read the Bible in English, the simple act of translating it into the tongue of the common people was a capital offense. 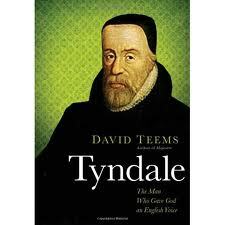 The book Tyndale: The Man Who Gave God an English Voice by David Teems takes a fascinating look at the man who committed this unpardonable sin. William Tyndale was born around 1495 (the exact year is uncertain) close to the Welsh border in the county of Gloucestershire. He attended Oxford and eventually obtained both bachelor's and master's degrees. Unfortunately, these were tumultuous times for religious scholars. It was a time of Thomas More, King Henry VIII, Martin Luther and Thomas Cranmer. While King Henry VIII could and certain did question church authority, anyone else who went against the accepted church teachings of the day risked being branded a heretic and burned at the stake. The early medieval church required unquestioning obedience to the word of church elders. Tyndale was a great lover of scripture and wanted to bring its message and beautiful language to the common people by letting Englishmen hear the word of God in their own language rather than the officially sanctioned Latin. He asked permission to translate the Bible into English, but was refused and sailed instead to Germany. While there he completed his translation and published it, and while copies did make it to England, the officials continued to rail at this blasphemy. Tyndale was hunted and eventually captured. He was strangled and burned at the stake as a heretic in 1536. What I found even more interesting than Tyndale's attempts to bring the word of God to the common people was his great impact and influence on our modern-day language. We often hear how many words William Shakespeare introduced into the English language. It turns out that Shakespeare was greatly influenced by the writings of William Tyndale. The book helpfully provides a listing of some of the English words that appeared for the first time in the writings of Tyndale. Among them: brotherly, network, childishness, unbeliever, viper, wave, refused and scapegoat. The author points out that about 0.02 percent of all quotations cited in the Oxford English Dictionary can be attributed to Tyndale. The book also contains a timeline of Tyndale's life as well as the text of some letters he wrote to a fellow "heretic" who was imprisoned in the Tower of London. In Tyndale's own words, we can see the humility and strength of the man who gave God an English voice.